From the Wellcome Trust Centre for Mitochondrial Research (A.P., H.J.N., H.G., K.D., M.S.-K., P.F.C., R.H.), Institute of Genetic Medicine, Newcastle University, Newcastle upon Tyne, United Kingdom; Medical Genetics Center (A.A., L.F., B.C., S.K., E.H.-F.), Munich, Germany; Division of Neuropediatrics and Muscle Disorders (J.K.), University Medical Center, Freiburg, Germany; Department of Paediatrics (I.B., M.C. ), University Hospital Center Zagreb & University of Zagreb, School of Medicine, Zagreb, Croatia; Department of Paediatrics (M.K. ), Hospital Baden-Baden, Germany; and Department of Molecular Genetics and Diagnostics (V.K. ), NIEH, Budapest, Hungary. 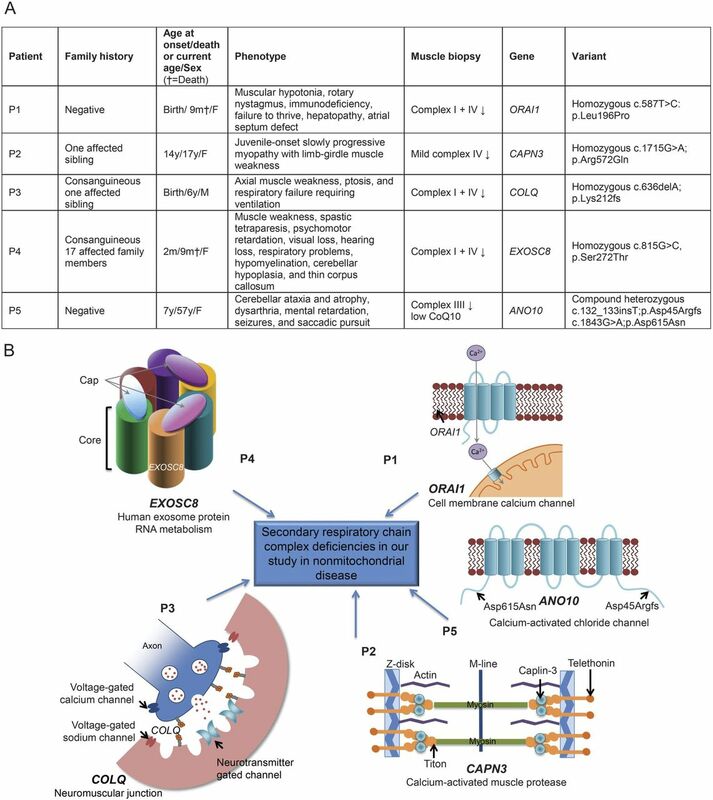 (A) Table of clinical and molecular genetic characteristics of 5 patients with heterogeneous phenotypes and biochemical features of respiratory chain deficiency. (B) Crystal structure of the human exosome complex involved in RNA metabolism. EXOSC8 highlighted in pink. ORAI1, calcium channel located on the cell membrane. ANO10, calcium-activated chloride channel located on the cell membrane. CAPN3, an intracellular calcium-activated neutral protease isoform located within the sarcomere. COLQ protein, a collagen-like subunit associated with acetylcholinesterase in skeletal muscle. CoQ10 = coenzyme Q10.